Hydraulic engine mounts are widely used in the automotive, marine, and construction machinery industries since they are more effective than conventional elastomeric mounts. Low frequency (1-50Hz), high amplitude (1-2mm) vibration from shock excitations. Shock excitations are caused from driving on uneven roads, or from sudden vehicle acceleration or deceleration. High frequency (30-250Hz), low amplitude (0.005-0.5mm) vibration from unbalanced engine forces. Unbalanced engine forces are caused from the firing pulses, and from any mass imbalance that exists in the rotating and reciprocating engine parts (e.g. in the piston, connecting rod, crank, etc.). To isolate the chassis from the unbalanced engine forces, the mount must be soft and lightly damped in the high frequency range. However, to prevent the engine from bouncing under shock excitation, the mount must be stiff and highly damped in the low frequency range. If the engine bounces with large amplitude under a shock, the engine components and surrounding vehicle structure can be damaged. Therefore, to satisfy these conflicting requirements, the dynamic stiffness and damping of the engine mount should be frequency dependent. The dynamic stiffness of an ideal mount is shown in Figure 1. Since low frequency vibrations usually lead to larger amplitudes, and high frequency vibrations lead to small amplitudes, an amplitude-dependent mount can also be used. Hydraulic engine mounts can be highly tuned to approach the ideal stiffness shown in Figure 1. These mounts are much more effective than conventional elastomeric mounts whose dynamic stiffness is nearly invariant under the amplitudes and frequencies in the concerned range (1-250Hz and 0.005-2mm). The optimal design of hydraulic engine mounts requires detailed numerical analysis that accurately captures the highly nonlinear behavior of the fluid and the structure. Numerical modeling of hydraulic engine mounts is challenging. The model must account for contact between the parts, and for viscoelastic effects in the rubber. However, the greatest challenge lies in solving the fully coupled fluid-structure interaction (FSI) equations for the enclosed flow. A Direct FSI Coupling solution method must be used. It is very difficult to obtain a solution using an Iterative FSI Coupling solution method. ADINA is widely used to analyze hydraulic engine mounts. ADINA is often the only viable simulation software program for hydraulic mounts because it uniquely offers both Direct and Iterative FSI Coupling solution methods. This Tech Brief focuses on why the Direct FSI Coupling solution method is required to analyze hydraulic engine mounts. We consider a simple hydraulic engine mount to illustrate the concepts, and give a step-by-step tutorial at the end of the Brief. 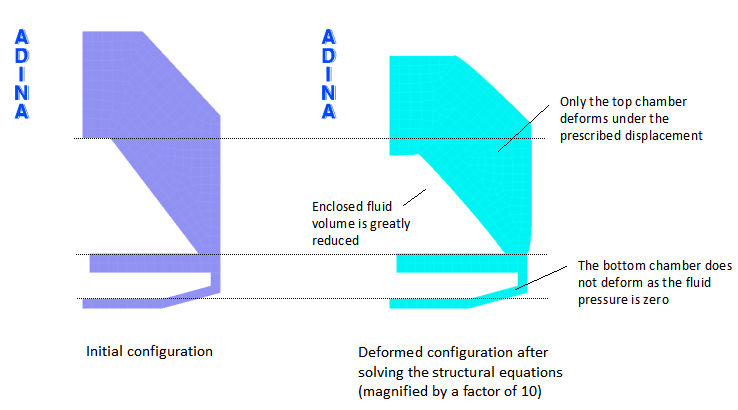 An example of a more complex hydraulic engine mount analyzed using ADINA is given here. A schematic of the engine mount considered is shown in Figure 2, and a movie of the results is shown above. Since this Tech Brief focuses on the FSI coupling solution method, the Ogden hyperelastic material model is used, without any viscoelastic effects, and we assume there is no contact between the parts. In the analysis, we first preload the hydraulic engine mount by the engine deadweight, and then we prescribe a sinusoidal displacement to model the engine vibration. Since the hydraulic fluid is enclosed by deformable boundaries, we solve the problem using the Direct FSI Coupling solution method. In the Direct FSI Coupling solution method, see Ref., the fluid and structural equations are combined in one fully-coupled coefficient matrix and solved using the Newton-Raphson scheme. As a result, the effects of structural deformations are immediately “seen” by the fluid, and the effect of fluid pressure is immediately “seen” by the structure. The Direct FSI Coupling solution method is required for FSI simulations of nearly incompressible flow enclosed between deformable boundaries. Since the flow is nearly incompressible, a displacement of one structural boundary must be balanced by a displacement of another boundary to conserve the fluid volume. Any small change in fluid volume will generate extremely large pressures. When the Direct FSI Coupling solution method is used to solve the hydraulic engine mount problem, the fully-coupled fluid-structure equations easily converge. In the Iterative FSI Coupling solution method, the fluid and structure equations are solved individually, in succession, always using the latest information provided by the other part of the coupled system. The program iterates until the solution variables satisfy all fluid and structural equations. To obtain deeper insight into the difficulty, let us consider the solution at each FSI iteration. In the first FSI iteration, the program first solves the fluid equations, assuming the undeformed structural configuration, to calculate the pressure distribution. Since the fluid boundary is enclosed by the structure, the pressure solution is zero. Next, the program solves the structural equations using the latest fluid pressure on the FSI boundaries, which is zero. As a result, only the top chamber of the rubber mount deforms under the prescribed displacement, and the enclosed fluid volume is greatly reduced, see Figure 3. In the second FSI iteration, the structural displacements from the first FSI iteration are used to update the fluid boundaries, and the fluid equations are solved with this new domain. Since the enclosed volume has greatly reduced and the fluid is nearly incompressible, the predicted pressure is now extremely large (> 1 x 1015), and the program crashes with the excessive pressure error message given above. It is clear that the instability in the Iterative FSI Coupling solution method arises because the structural equations do not account for the change in fluid pressure as the structure deforms. The fluid pressure is always based on the structural configuration of the previous FSI iteration. Reducing the time step size or using small relaxation factors will not overcome this instability. Significantly reducing the bulk modulus of the hydraulic fluid will help; however, this changes the physical problem. The Direct FSI Coupling solution method does not suffer from this instability and can be used to obtain a solution for the hydraulic engine mount problem without changing the physical problem. This Tech Brief shows how ADINA FSI uniquely offers two different methods, Direct FSI Coupling and Iterative FSI Coupling, to solve a wide range of FSI problems. The Direct FSI Coupling method offers great robustness when solving difficult FSI problems such as enclosed flow between deformable boundaries, flows abutting highly flexible structures, or highly compressible flows abutting stiff structures. These types of problems are difficult to solve using the Iterative FSI Coupling solution method. After working through the tutorial, we suggest you try to solve the problem using the Iterative FSI Coupling solution method. Try reducing the time step size, using small relaxation factors, etc. Can you obtain a solution?